Infertility. Colleen Hoover decided to tackle a married couple struggling with infertility. Wow. I never knew how many women (and men) were affected by this issue until I had my own struggles trying to get pregnant. I won't go into all of my personal story here, but the gist is eighteen months of trying plus one miscarriage. My mother and sister both had miscarriages while trying to get pregnant too. When we announed our pregnancy on Facebook the first time we briefly mentioned our struggles to get pregnant (which I'm fully aware don't compare to what many women face), and I can't tell you how many people contacted me publicly and privately to tell me that they had or were struggling with infertility as well. This topic is so, so personal to many. And Colleen Hoover did it justice. She really did. That being said, I could and could not relate to Quinn. Where Quinn and Graham had been trying to get pregnant for several years, it only took me a year and a half. Even through that year and a half each and every month was a roller coaster of emotions. The hope. The disappointment. I never got to the level of depression as Quinn though. While each month that it didn't happen for us was a huge disappointment, I just wasn't to the same level of devastation. I didn't struggle with touching my husband or carrying on our physical relationship. I did go through a period of several months of almost sabotaging our chances in a backwards attempt to prevent my disappointment. How screwed up is that? Husband and I did take a "break" from trying where we just hoped it would happen naturally. Eventually we had to have help with a round of medication to ensure my cycle was regular (it was not). But through the entire process I had a lot of mental struggles that were a bit different from Quinn'--yet so similar. I wondered if I was being punished by God for some prior sin in my life. Yet I had to work my way back to the place in my faith where I believed that God is still good...even if He never blessed me with children. Quinn's journey isn't really spiritual at all, but she does have to work toward finding a way to be happy no matter what path her life goes. Graham guys...I mostly loved him, but there were a few moments I hated him. He tried so incredibly hard to support Quinn while keeping their marriage afloat. He took so much pain from her yet tried to minimize the amount of pain she felt. It was easy to see that through their struggles he was still completely in love with her. Even still I was so angry and disappointed in him at one point. Despite that, his fight to save their marriage was something beautiful to read. 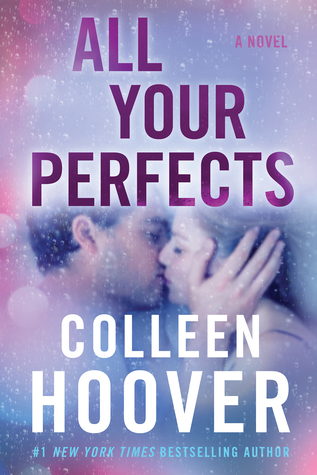 I really appreciated Colleen Hoover's portrayal of marriage in this book. While I love to read books about romance and relationships, sometimes book relationships are so beyond unrealistic...especially when it comes to happily ever afters. Colleen Hoover really showed how much commitment and effort it takes to maintain a marriage...ANY marriage. I love books, but sometimes I hate how effortless they make relationships seem. A character is attracted to another character. They feel some physical sensations. All of a sudden there are emotions. And it was fate. The end. Nothing real. No substance. Nothing to fight for. And no struggles. All Your Perfects showed one of the most real marriages and struggles that I've read. -Graham laughs, "You say that like marriage is a Category 5 hurricane." ... "Not all the time. But I think there are Category 5 moments in every marriage." -Betrayal hurts the same on any level when it's your husband doing the betraying. -"Most girls grow up dreaming of a successful career. I was always too embarrassed to admit that I wanted to work from home and have a bunch of babies." "That's not embarrassing." "Yes it is. Women nowadays are supposed to want to amount to more than just being a mother. Feminism and all that." -...a person can understand a behavior without excusing it. -No matter how much you love someone--the capacity of that love is meaningless if it outweighs your capacity to forgive. -A person can't confidently proclaim what they would have done or how they would have felt in a situation they've never been in. All Your Perfects does jump back and forth chronologically which is something that I usually struggle with. In this case, I didn't mind it at all. Each section was interesting enough on it's own that I never dreaded swapping from then to now or vice versa. The "Then" sections were where we got to witness Quinn and Graham fall in love and where you get the warm and fuzzies. The "Now" sections dived deep into the conflict of the infertility and marriage struggles these two had. Both were emotionally gripping. I do want to warn that there is language and sexual scenes and content. All in all, I loved All Your Perfects. I'll give it 4.5 Stars. I read it quickly. I loved the characters and their struggles. I loved the honest and real portrayal of marriage as well as infertility. I felt a wide range of emotions while reading this one. Where normally books that alternate chronologically really bother me, All Your Perfects did not. Have you read All Your Perfects? What did you think? Let me know!